In most places in the world, as electrification developed, countries have organized and controlled electricity generation. Yet, several regions (UK, Scandinavia, South America, Norway, Texas, New England, New Zealand…) have been liberalizing their electricity market for the two last decades. They believe that liberalization will lead to more efficiency, more technological innovation and lower prices. But, as California has experienced it, liberalizing this market is no piece of cake! Why? Isn’t it just like any other market? Unfortunately, the way electricity is produced and sold is very different from shoes. For one thing, it cannot be delocated in some Asian country where the cost of production would be greatly reduced. But there are several other reasons why this market is a little particular, and we need to list them all to have a better understanding of this market and choose the right way to regulate it (regulation is a particular case of mechanism design). A little warning: this will be a little scary at first, but I’ll eventually say why it can work. First, as it requires high amounts of capitals to build generators, there usually are only a few companies that generate most of the electricity. The market only has a little number of producers (unlike shoes that can be produced by any trained kid in the world). Hence, it is a natural oligoply. It is actually the reason why it was centralized and state-owned in every country in the world at first. OK, there are only a few producers… But is it bad? In oligopolies, companies have incentives to keep prices higher than the cost of production (see the Cournot competition). As a matter of fact, they can easily create scarcity, which would justify higher prices. What’s more, for the same reason, they have power (not only electric power!) over people and over governments. They could even threat everyone by saying: “If you don’t do what I want, I’ll shut down my generators and create blackouts”. And I am not even talking about possible cooperations to keep prices even higher (this is known as a cartel and is illegal in most countries but is hard to prevent). However, cheaper generators can now be built. In addition, innovative technologies emerge and create new sorts of competitive generators. Some of these new technologies does not necessarily need a lot of investment. Hence, small generator companies can now develop more easily. Electricity is electricity. There is no “better electricity”. As a result, there cannot be any product differentiation. In particular, there cannot be some sort of Louis-Vuitton electricity. Obviously, richer people will not overpay their electricity… But that’s not bad, is it? This also means that there is no low-cost electricity for people who want to save. The market cannot adapt to each person. In particular, poorer people will have to pay the same amount for electricity as richer people. I guess this is not too bad for richer people, but it could be pretty bad for poorer people. What about batteries? They store electricity, don’t they? They do. But they are way too expensive. Some projects like BetterPlace corresponding to car batteries are interesting concerning electricity storage, but even then it will not be sufficient. Enormous batteries have also been built in Alaska or in China, but, according to POPSCI, the 36 MWh that the chinese battery can store are just enough for 12,000 homes for only an hour. OK, but scientists have ideas, right? I mean, they are looking into it, aren’t they? Sure, whenever a lot of money is involved, plenty of people are interested, even scientists! I guess I should start by pointing out that coal, oil and gas are energies that are stored and that can be burnt quickly at any time (that is, unfortunately?, what makes them so useful, as opposed to wind turbines, solar and, to some extent, nuclear energy). Some dams can pull water upstream, which is a great way to store energy. In Germany, wind turbines can compress air when they are not producing electricity. Even better, English scientists are devising a way to store energy in oil by using carbon dioxide of air, hence making oil a clean energy! There are other ideas harder to explain, and if you know them, you should write posts about them! As energy cannot be stored, power shortage can happen more easily. Generators may have difficulty to answer the demand in electricity at peak hours, which leads to very high prices at those moments. And peaks of demand happen every day, especially in a dense developed areas. 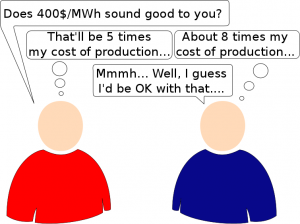 What’s more, not all sources of electricity can modify the output quickly. For instance, nuclear plants need days to start functioning, and increasing the output can’t be done in matters of minutes. Solar plants only have sunlights during the day. Even worse, the output of wind turbines cannot be controlled! 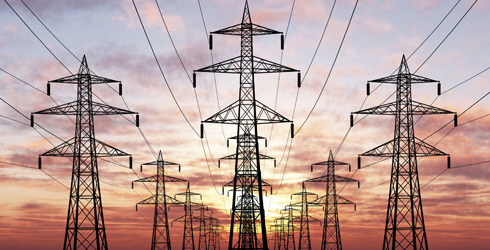 This could lead to surprising situations in which the flood of electricity overloads the networks, hence leading to a negative price of electricity (please consume electricity otherwise components of the electricity network will explode!)! Don’t worry too much about overloading though since turbines can be shut to prevent such a thing to happen. It gets even worse (I told you I’d scare you!). In periods of peaks of demand, companies have even more incentives to simulate a power outage to make prices skyrocket. This is what the Enron company is accused of having done. Of course, in that case, the consequences of their actions were obvious since cities were in the dark, but they could have increased (and they probably have) without causing an actual blackout. Storing energy cheaply would diminish the effects of those peaks of demand which would greatly decrease the global prices of electricity. This means that the demand does not depend on the price. Just like most (normal) people, I never check the current price of electricity when I turn on the light. The way we decide to plug in our machines does not depend on the price of electricity. Of course, after seeing our electricity bill, we sometimes decide to shut our stuffs off more often. But this reaction is not immediate (although, according to Koichiro Ito, consumers do react to average price). I get it! Since we don’t focus much on the price of electricity, generators can trick us, right? Precisely! If the demand were not inelastic, it would decrease as generators increase prices. This would give an incentive for generators to decrease their prices to increase their profits. But, with an inelastic demand, the generators have incentives to put prices high. See wikipedia for more information on demand elasticity. Oh my god! All of that sounds so bad… Can’t you give us any good news? I think I’ve listed most of the scary particularities of this market. I’ll now get to the reason why, despite all those particularities, liberalization, if done well, could be not too bad. The construction and management of the electricity grid is a natural monopoly because it needs a huge capital, is hardly profitable, must be a social good and needs to thought globally. For those reasons, it usually is a state-owned. That is a very good thing: the government can therefore control the generators since it controls their distribution means. Cool! Let’s make only the cheap and honest generator companies produce! If only it were that simple… But finding out which generators are honest is very hard. Still, let’s try to advantage the cheapest producers, in order to lower the price of electricity. 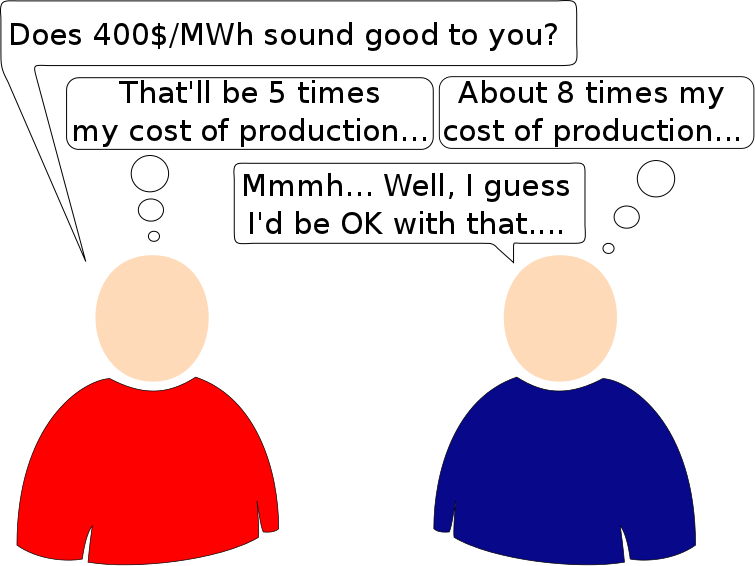 In practice, all generators are asked to announce their supply functions, which means that they have to say, for any given price of electricity, how much they can produce at this price. Then, we’ll aggregate those supply functions to choose dispatches that minimize the global cost of output, and this will give us the lowest possible prices of electricity. This is known as the Locational Marginal Pricing (LMP). The prices are then fixed based on the optimal dual variables (this is quite technical and you should read my articles on linear programming and duality in linear programming if you want to understand it). I should mention (even though it is a little technical) that for that to work supply functions need to be increasing, which means that for higher prices the companies need to offer more outputs. But it is not too bad an assumption, since generator companies have several plants. They can consider a cost of output for each plant. Their cheapest outputs will be the output of the most cost-effective plant. They can produce more at higher prices by making work more cost-effective plants. By the way, do companies pay the electricity network company? Of course, they do. But how they should pay the electricity network company is also a very tricky question. So far, two methods have been developed: flowgate rights and financial transmission rights. Commenting them would take me quite a while, and I’ll get to that in another post. Let me recapitulate. As said earlier, the transmission network is the key for governments to control the electricity market. But, despite that, generators still have an important market power. Fortunately, this market power can be reduced. Let’s see how! To prevent companies from lying, one thing we can do is verifying they are not lying. One way of doing that is to have a regulation agency visiting generators and controlling if the announced costs are the actual costs are not. This is what happens in Europe. I personally see three problems with this. First, there is no guarantee that the regulation agency will actually be able to evaluate whether companies are lying or not, since estimating the costs is very complicated (it’s actually a problem within companies). The regulation agency needs to have a lot of power and a lot of manpower to do that, which leads me to my second point: this may be quite expensive. Finally, the third and main reason why market regulation can be difficult: the interconnections of networks between different regions. A regulation company of a state can control the companies in his state. But for juridical reasons, it’s much more complicated to control companies outside his own state. Yet, those companies may be the one responsible for a sudden scarcity in electricity. As contributors have pointed it out to me, the development of generators using sustainable energy has enabled the creation of many companies. The power of major companies is diminishing, and their market power too. It’s something that we should encourage, including with financial subventions. But it still might not be enough. I do. I believe that you need to have state-owned generator companies to regulate the electricity market. As said earlier, otherwise, generators could easily create scarcity that would make the prices skyrocket. This is the case in New Zealand, where several generator companies are state-owned, or in France, where Électricité de France (EDF) is by far the main producer. State-owned generator companies do not need to be that cost-effective. But they need to be able to produce high amounts of electricity (even if it is at a price much higher than the usual price). As a matter of fact, this way, if other private generators try to create a power shortage, state-owned generators can supply the missing power and avoid a huge increase of prices. Of course, as they may not be very competitive, it will create a loss for the state. The electricity market has a lot of particularities (natural oligopoly, homogeneous product, can’t be stored and inelastic demand) that makes it hard to liberalize. As a matter of fact, if the liberalization is not done carefully, generator companies may obtain a huge market power, in which case they can create scarcity to make prices skyrocket. Controlling them is hard. But we can diminish market power by controlling companies, investing in small generator companies and having a state-owned generator company that can supply the demand if other companies try to create a power shortage. I would like to point out that I am not an expert on electricity nor energy nor economy (I do maths! ), although I have worked on the electricity market in New Zealand for 3 months. But comments from contributors have helped me improve this article by filling the numerous gaps of my knowledge. I thank them very much. This proves how you can write a great post without a perfect knowledge on the topic, as long as others help you improve it. I hope it encourages you to write articles! Very interesting post !! I learned a lot !